Day 1 of the challenge begins a week of primary color manicures. 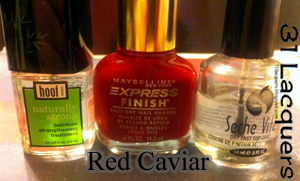 I chose a great nail polish that I picked up at my local Dollar Tree: Red Caviar by Maybelline Express Finish. Now, you would think that a 35-year-old woman like myself would know how to properly paint her nails, right? Well, you'd be wrong. No matter how careful I am, I always seem to get polish all over my cuticles and fingers. See? 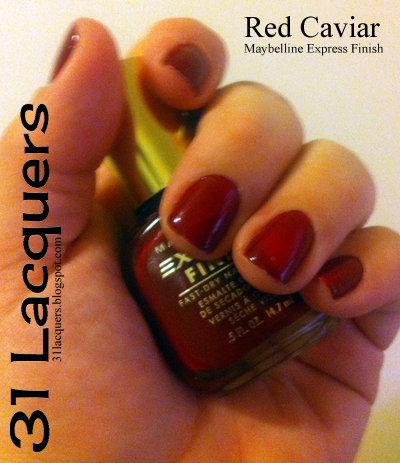 Here are a few swatches of Maybelline Express Finish's Red Caviar nail polish on a nail wheel. Each "finger" has two coats of Red Caviar. Finally, here are the products I used for this manicure. I started with Hoof Hands Naturally Strong Bamboo Strengthening Treatment, then the Red Caviar, then finished it all off with good ol' Seche Vite. Overall, this is a truly luscious red creme nail polish. The application was smooth, although I made a mess of things. I should have used thinner coats on my nails like I did on the nail wheel. I will definitely use this color again since it's a fast drying fabulous red. What's your favorite red nail polish? I'm an OPI girl, but I love how quickly these Maybelline Express Finish polishes dry. Thanks for reading, and remember to subscribe!